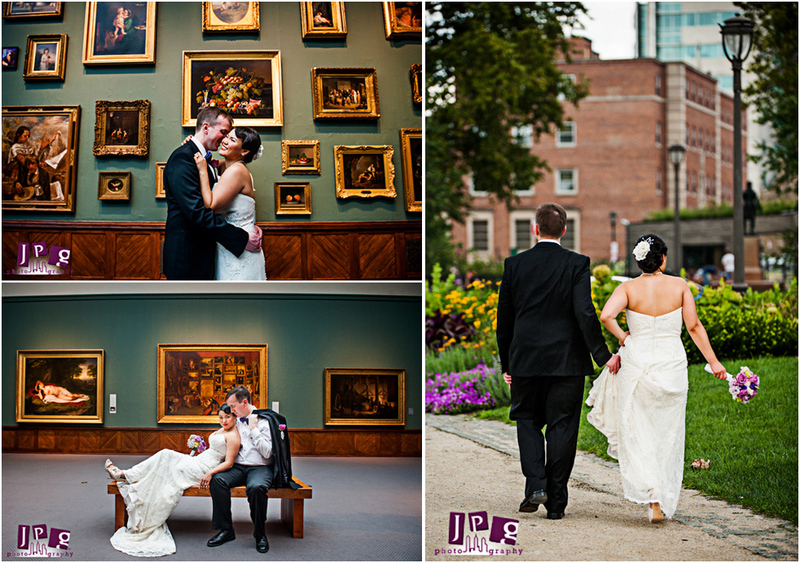 Sunny and Francis Married at PAFA! 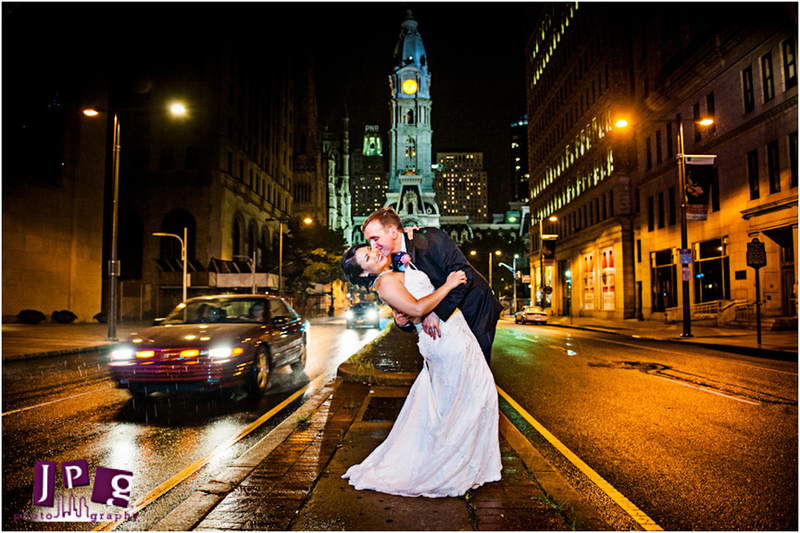 When you want to have a wedding that incorporates the perfect mesh of fine culture and silly party guests, why not have it at the Pennsylvania Academy of Fine Arts? That’s what Sunny and Francis did, and their huge smiles were proof of their happiness in their choice. They truly showed how much they love their artistic side (just like when they had their engagement photos here), and how much they appreciate the ridiculousness of their family and friends. The perfect paradox. Corinne was with the guys as they prepared. Francis led the gentlemen over to Logan Square, where they relaxed at a café with some tasty San Pellegrino waters. Meanwhile, Sunny and her bridal party were marveling over their bouquets with smiles and giggles. 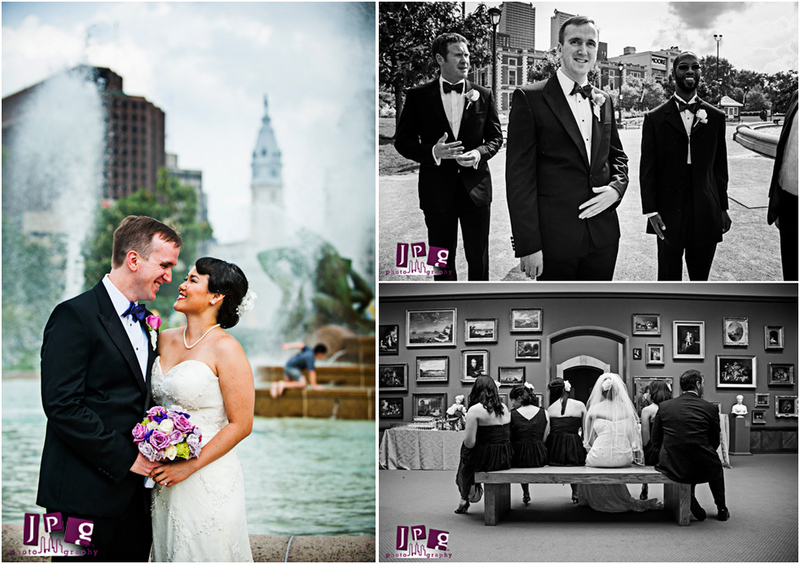 Everyone was very relaxed, which made shooting this wedding such a fun job! 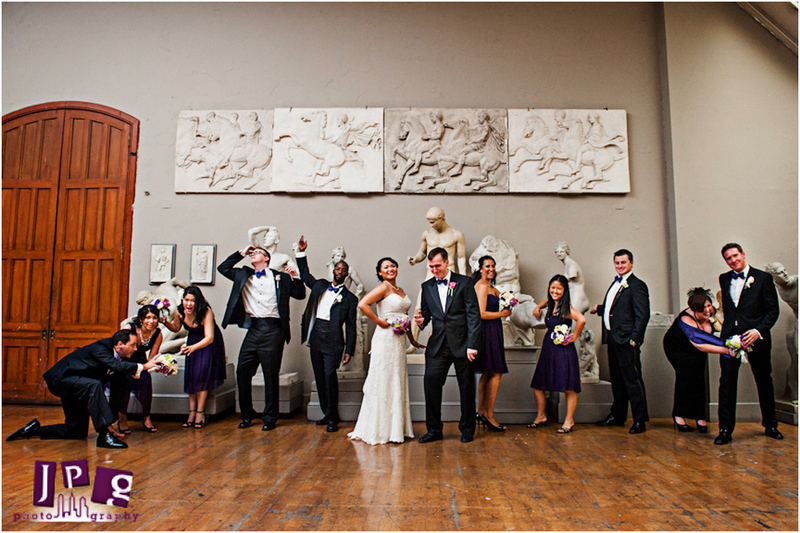 Before the ceremony, the wedding party decided it would be a cool idea to have their formals taken at the PAFA’s sculpture room. 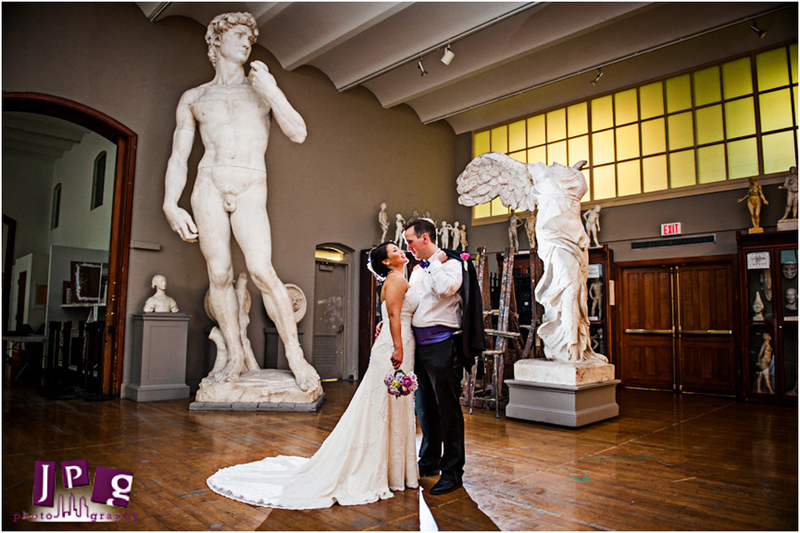 So, after a few shots beside the outdoor fountain, we moved indoors to the fine arts collection…and then the wedding party started imitating the sculptures. It was awesome to see the party let loose, and just be silly. 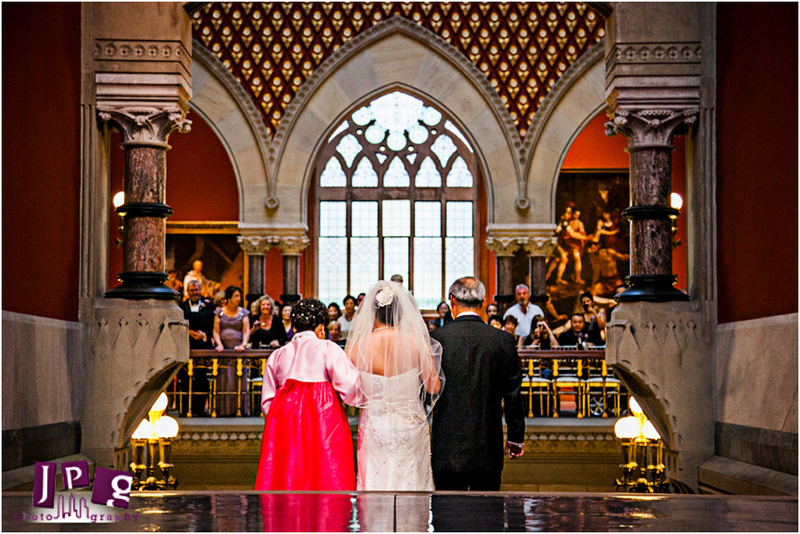 The ceremony was held on the main staircase, allowing ample room for the guests and beautiful photographs for us. They had a violinist play for them, in lieu of a piano. Both Sunny’s mom and dad walked her down the aisle, and kissed her on the cheek. I loved it when one of the speakers was reading from “The Road Less Traveled,” by Robert Frost. Such a great poem! 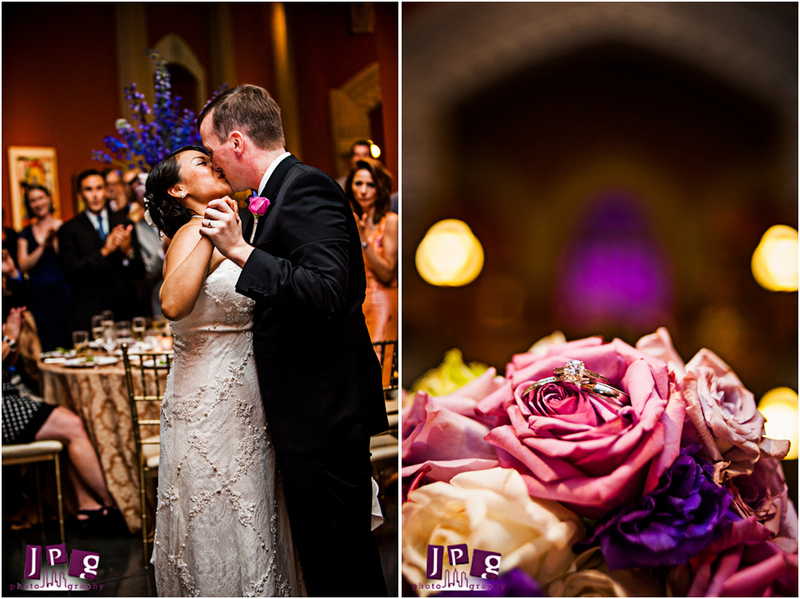 Their reception was also excellently done, as their friends and family told memorable tales of the couple. A few of them would tell some awkward stories, and hold up some signs that said, “story!” There were also photos taken in front of some amazing paintings. And then the party started swing-dancing when the guests got to the reception, which was awesome! Congratulations to Sunny and Francis on a beautiful wedding, and thank you for letting JPG in on your day. May you always embrace the beauty of life with “stories” and swing dances.